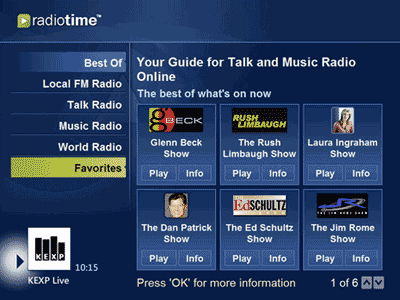 RadioTime web service allows access to different radio stations worldwide. It also has an add-on that allows you to listen to radio in Windows Media player. You can access to thousands of DJs and on-air personalities from your zip code and around the world. You can also listen to favorite internet radio or local FM stations. You can browse different radio station as displayed in a neat interface. Hit the play button to listen radio station within Windows Media Player. RadioTime also has ‘red button’ feature that allows recoding of online radio (paid service). Grab the install for cool radio in Windows Media Center. More details to configure in the help section.